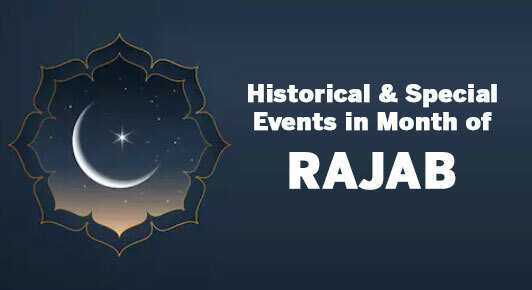 Rajab is the seventh month of the Islamic Calendar. The following are the months of Islamic calendar which starts with Muharram, Safar, Rabi al-awwal, Rabi al-thani, Jumada al-awwal, Jumada al-thani, Rajab, Shaban, Ramadan, Shawwal, Dhul Qadah and Dhul Hijja. Rajab is one of 4 sacred months of Islam. The Holy Prophet ascended to Heaven on the 27th of Rajab (621 C.E.) on either Sunday or Monday (Shab e Meraj). The battle of Tabook took place in the year 9 A.H. This was the last battle which the Holy Prophet participated in. The second Oath of Aqabah took place in Rajab, 12 A.H.
On 27 Rajab 583 AH / 02 October 1187 C.E. Salahuddin Al Ayubi Liberated the Al Quds & Al Aqsa. On 28 Rajab 1342 AH / 03 March 1924 C.E., the saddest event in islamic history took place, with the destruction of the Caliphate.